What an amazing – and long – week! I’m excited to recap this week in my five favorite moments. PLUS, a workout by yours truly, #sweatpink, & Hedstrom Fitness. Women’s March on Denver! A sure highlight of this week was marching in downtown Denver with my law school besties, Anna and Maggz (missing Jenn)! On Saturday, January 21, we put on our activist attitudes and marched for women’s rights along with ~100K other people in the Denver community. What were the coolest parts about the March? The positive energy from all the other marchers, a special bond with my besties, and arriving to law school on Monday morning to learn that so many of my colleagues (including males) marched, too! The power of community never ceases to amaze! Also on women empowerment, I received makeup from Sweat Cosmetics (an all women, girl bossin’ company) located in Denver. Sweat Cosmetics is all former professional women athletes dedicated to making perfect and functional makeup for women who like to get sweaty (fitness enthusiasts and athletes). Definitely check them out! Teaching Group Fitness! By and large, teaching group fitness fills my heart with gratitude, allows me to release energy and negativity in a positive and constructive way, connects me with my local community, and inspires me to get up, get out, and sweat! This semester, my teaching schedule is somewhat crazy, but absolutely worth it! Thank you to all of my group fitness students for you dedicated time each week to sweat together! Girl bossin’ Fit Approach! This week we had some very exciting development calls for our 2017 planning around community growth, BlogFest, EMPOWER race/retreats, and HIIT Yoga. 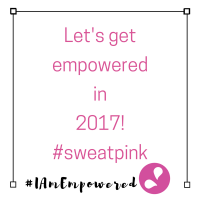 Get excited for all the #sweatpink action to come…I know I am stoked! Meeting with local law professionals! It is generally so awesome to speak with and learn from local lawyers in the Denver area. This week, I was lucky to grab a breakfast with my assigned professional mentor and lunch with a firm connection through my mentor professor at UC Berkeley. Both men do very different things (transactional v. litigation) but I enjoyed learning from each of them and soaking up their knowledge. I’m excited for summer 2017 to start working with attorneys and applying the knowledge/skills I’m currently learning. Trying new exercises! This month, I’m grateful to review the Kamagon and SURGE workout equipment from Hedstrom Fitness. Last week, I reviewed the SURGE and shared a workout with you! This workout can be done with or without the Kamagon workout equipment. For full video instruction, follow along with this video, featuring the PDX #sweatpink team! The Kamagon is seriously so awesome and mobile. Typically, I workout with the Kamagon in my apartment (with the help of coach @hollythepupster) or take it outside for some sunshine and sweat! The ball is filled with water and can weigh up to 10lbs full. If you’re interested in purchasing the Kamagon to add to your personal gym set, use the code SPHF25 for 25% off between 1/20 and 1/28. Disclosure: I received the Kamagon from #sweatpinkpartner, Hedstrom Fitness to show you my Favorite Friday Fives for the week of January. Stay tuned for more Friday fun!